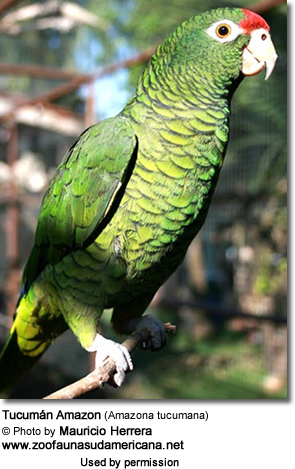 The Tucumán Amazon (Amazona tucumana) is native to Northern Argentina where it is found in the provinces of Tucumán, Salta and Jujuy as well as Southeast Bolivia in provinces of Chuquisaca and Tarija. They prefer forested areas between 3,400 and 7,300 ft; but may migrate to lower altitudes in autumn and winter (1,000 ft). They inhabit woodland areas (especially with Alnus acuminata or Podocarpus parlatorei). They are rare and endangered due to habitat destruction and trapping for the pet trade. 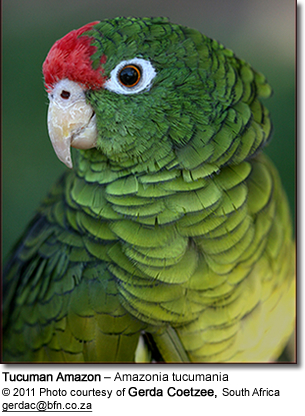 The medium-sized Tucuman Amazon averages 10 - 12.4 ins (25 - 31 cm) from head to tail. 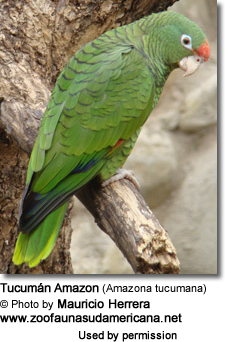 Its overall plumage is green and all feathers have a pronounced black edging, except for the wings. There is red patch on the forehead and fore-crown, and the red does not extend around the white eye-rings. It has red primary wing feathers and there is no red at the bend of the wing. The thighs are partly orange-yellow and the primary wing feathers are green with blue tips. The underside of the wings are olive-green. The upperside of the tail is green with yellowish-greenish tips and there is red at the base of the tail. The bill is light horn-colored, the irises orange-yellow irises and the legs are pinkish-grey. Female as male, but with six red primary wing feathers at most; usually less. Remainder of primary wing feathers are green. Occasionally all primary wing feathers are green. Immatures look like females with partly green primary wing feathers. They have less red on their head; their thighs are green and their irises are dark brown or dark grey. 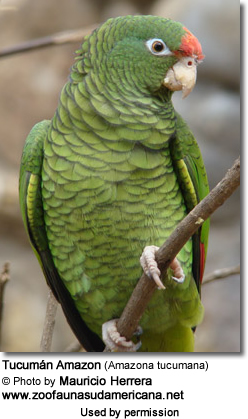 This is a medium-noisy parrot, which can be especially noisy in the morning and evenings. They are not hard chewers and enjoy being sprayed. They are active and like to fly. They don't become as confiding as other parrots towards their caretakers. Even after acclimatization period, newly imported birds are not as hardy as other amazons. They may be kept in a communal aviary outside the breeding season. However, during the breeding season, it is essential to separate breeding pairs from other birds, as they become very aggressive and territorial during this time. Breeding is usually easily achieved. As far as nesting facilities are concerned, they like natural stumps with 12 ins. (30 cm) diameter, but will accept a nest box 12 x 12 x 20 ins (30 x 30 x 5 cm) with entrance hole of 4 ins (10 cm). Breeding activities usually commence in early May. The hen lays 3 to 4 eggs, a relatively high percentage of which are infertile. The incubation time is 23 to 27 days and the young fledge after 50 to 55 days. The young continue to be fed for up to 10 weeks after leaving the nest. Both male and female raise the chicks. 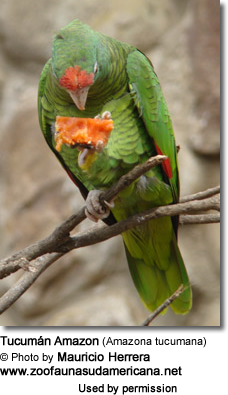 The natural diet of the Tucuman Amazon consists of seeds, fruits, berries, flowers and nuts. a seed mix of safflower, wheat, oats, canary grass seed and various millets, sprouted in spring and summer with sunflowerplenty of vegetables and fruits, especially, apples, cucumbers, carrots, rose-hips, elder and rowanberries, half-ripe maize, and greenfood.regular mineral supplement\To learn more about the diet of the captive Amazon Parrot, please visit this webpage.